One of several lines of research in my lab applies molecular phylogenetics to questions of social evolution in bees. A second line focuses on the evolution of color pattern in bumble bees, which have evolved striking Muellerian mimicry patterns worldwide. A third line is developing new protocols to assess the status of recent population decline in North American bumble bees, including the use of natural history museum collections to reconstruct the genetic structure of historical populations for comparison with current populations and development of genomic markers for application to questions of temporal influences on population changes from recent anthropogenic factors to ancient climatic events. We use molecular data to reconstruct phylogenies of bees that belong to the corbiculate clade within the family Apidae (subfamily Apinae), including bumble bees (Bombini; link to pdf of the Bombus tree), stingless bees (Meliponini), and orchid bees (Euglossini); a fourth corbiculate tribe comprises the honey bees (Apini). We have inferred individual phylogenies of these tribes. These phylogenies allow rigorous tests of evolutionary hypotheses and provide a critical framework for predicting environmental influences on various phenotypes, including color pattern, nest architecture and colony-level behavior, such as aggression, division of labor and communication. 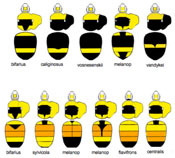 The recently completed phylogeny of bumble bees is the foundation for expanding our research into a new area, applying the tools of evolutionary developmental genetics to examine evolution of the extraordinary color pattern complexes (mimicry rings) in bumble bees (developing research directions). Currently, we are identifying the pigments found in the variously colored hairs of bumble bees, which will allow us to target candidate genes as factors governing the spatial and temporal expression patterns of hair pigments. We are also using the comparative method to examine the degree to which phylogeny explains bumble bee color patterns and the rates at which different body regions change color. My lab is part of a multi-team research effort to understand the causes of decline in several species of North American bumble bees (NRI). At the moment, there appears to be a phylogenetic component to the decline, which is most evident among species within the subgenera Bombus sensu stricto and Thoracobombus (pensylvanicus-group). The team is examining multiple target species of bumble bees across the U.S., collecting data on current population status, genetic population structure and pathogen loads. We are also generating microsatellite data from our large museum collections of Bombus, using non-destructive sampling methods to assess historical population structure, which we will compare with current population data. See highlights from our first summer survey (2008). My behavioral research focuses on comparative studies of tropical bumble bees, using the Bombus phylogeny for insights into species relationships and comparative studies of behavioral modifications associated with living in tropical wet forests. Behavioral features include nest architecture and division of labor. Studies of recruitment communication (Dornhaus & Cameron; Nieh et al.) in tropical bumble bees could shed light on the roles of adaptation and phylogenetic history in their social evolution. Much of my field research takes place in the Amazon Basin of South America and, more recently, in Mexico. My students and I have made expeditions to Himalayan China, Burma, Malaysia, India, Turkey and alpine regions of Europe to collect bumble bees. Stingless bee expeditions have been made to South America and Malaysia. In a collaborative effort, UIUC faculty and graduate students have completed an online database of Hymenoptera (ants, bees, sawflies, and wasps) within the Illinois Natural History Survey (INHS). A total of 300,000 Hymenoptera records have been entered and georeferenced for all U.S. localities. The bumble bee (Bombus) collection, including the well known Frison collection, is one of the largest repositories of bumble bees nationally and internationally, and there are many other well represented groups of bees. The Survey has been home to leading figures in hymenopteran taxonomy, hence the collections are generally well-curated and contain valuable associated information, such as parasitoid/host and bee/pollen-source records.